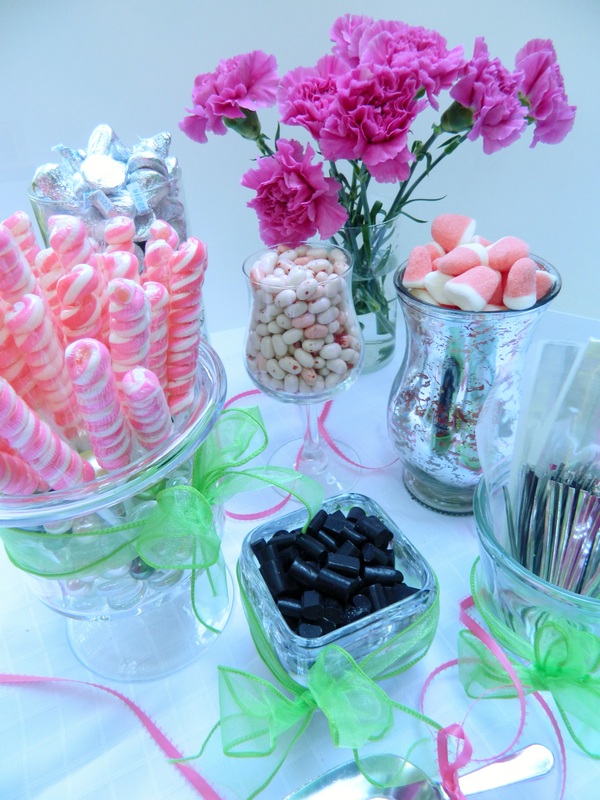 Kids of all ages like candy so why not make a candy bar for a gal or guy? 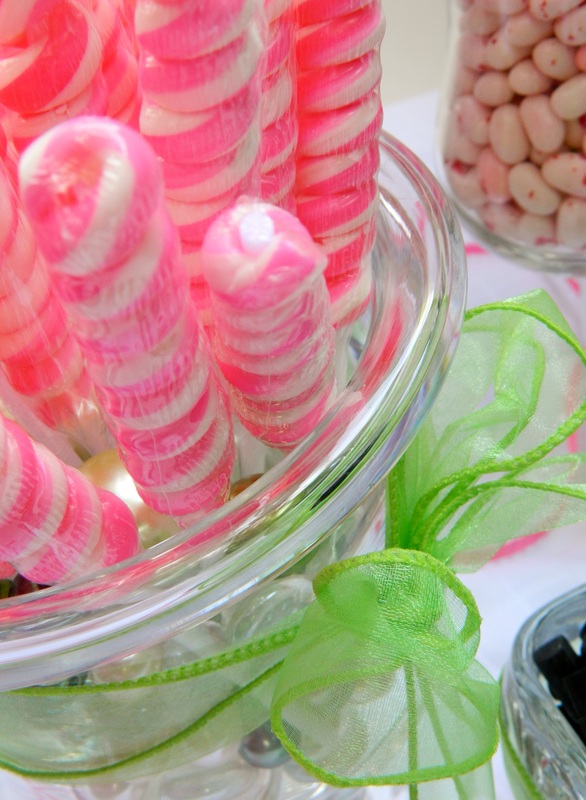 It’s a sweet twist to a birthday party, wedding or baby shower, special lunch, or even a BBQ! Here I chose pink for BilliJo the birthday girl who is turning 29 today. I went in search of pink-ish candy and decided to accent it with silver and black candies for interest. I used Hershey’s Kisses, Strawberry Cheesecake Jelly Belly’s, Pufflette’s Gummy Bites, black licorice and Tesla’s Tiny Twist Pops. I could have added more…dark chocolate covered almonds, pink salt water taffy…the sky’s the limit. The grocery store is a good start but you won’t find a large selection in one color. I found candywarehouse.com and did a search for “pink candy” and came up with a boat load of confections. They even sell the little silver scoops and candy bags. M&M Candies have a website where you can choose your color and customize the candy. It’s a lot of fun to mess around there because the site walks you through choosing colors, images and personalized messages. I found all the glass vessels around the house – a votive candle holder, wine glass, various glass things I use for flowers, and more. I added some lime green ribbon for color punch. I could have stuck with pink and that would have been fine too, but I love pink and green together and I’m not even a Delta Zeta! Put it all on a white tablecloth and the colors pop. This project was a lot of fun for me and all the guests who got to take a little memento of sweets home. We did this tablescape for the summer issue of Celebrate Home Magazine. 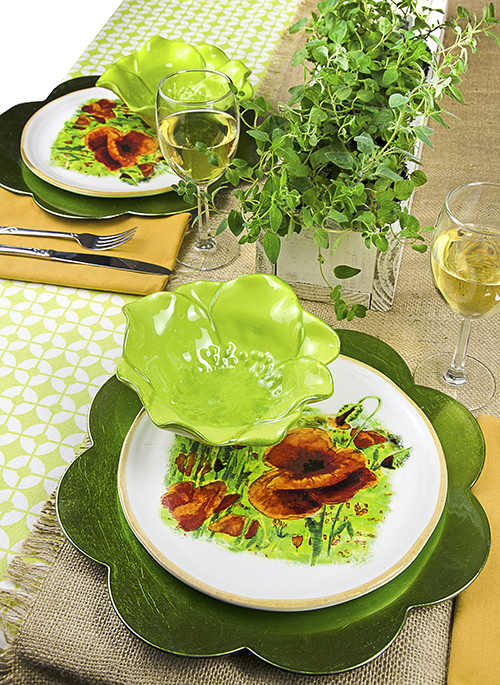 For more tablescapes, go to Celebrate Home Magazine. There’s something for every season there. Photo by Cindy Dyer.